Are Rwanda and South Africa Irreconcilable? 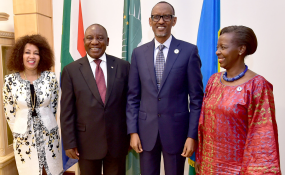 From left to right: South African Minister of International Relations and Cooperation Lindiwe Sisulu, President Cyril Ramaphosa, President Paul Kagame and former minister of foreign affairs and cooperation in Rwanda, Louise Mushikiwabo at the State house in Kiigali (file photo). After an almost five-year delay, the Randburg Magistrate's Court in Johannesburg last week finally launched an inquest into the murder of Rwandan President Paul Kagame's former spymaster Colonel Patrick Karegeya. Once very close to Kagame, he fell out with the president in 2007 and fled to South Africa. He was found dead, apparently strangled with a curtain cord, in a plush hotel in Johannesburg's upmarket Sandton suburb on New Year's Day 2014. Chief Prosecutor Yusuf Baba promised a full inquiry would start in January. Reading between the lines, he seemed to be saying that if this investigation led to State House, Kigali, so be it. That's where most detached observers believe an independent inquiry would lead - to Kagame's door. A strong suspicion that the Rwandan government was behind Karegeya's murder, and three attempts on the life of another senior dissident officer - former Rwandan chief of staff General Faustin Kayumba Nyamwasa - prompted Pretoria to expel three Rwandan diplomats and a Burundian diplomat accomplice in March 2014. Kigali responded by kicking out six South African diplomats. The mutual expulsions left both embassies staffed only by their ambassadors. Relations between the two countries have remained strained ever since, though they have thawed a little. South Africa now has six diplomats in Kigali while Rwanda's ambassador in Pretoria is still virtually alone. 'But relations are not fully back to normal,' a South African official said. The fallout between the two countries occurred on then president Jacob Zuma's watch. Zuma's successor Cyril Ramaphosa seems determined to mend relations. He met Kagame on the sidelines of the African Union (AU) summit in Kigali in March where the African Continental Free Trade Area (AfCFTA) agreement was launched. Ramaphosa announced that Rwandans would soon be able to get visas in their own country again. South Africa's visa service in Kigali abruptly ended when its diplomats were expelled. Kagame is clearly keen to mend relations too. In March he wanted South Africa's backing for the AfCFTA, which it hadn't yet given. Now it has. Kagame also wants South Africa's support for his proposed AU reforms, some of which Pretoria is still mulling over. The prospect of normalised relations seems premature to David Batenga, Karegeya's nephew who told journalists at the Randburg Magistrate's Court last week that he hoped it wouldn't undercut the inquest. He said he had been badgering the South African police and judicial authorities for almost five years to bring his uncle's murder to court. The apparently conflicting signals are causing a bit of confusion to others too. The revival of the long-dormant inquest into Karegeya's death has suggested to some that the Ramaphosa administration is more determined than its predecessor to get to the bottom of Kigali's alleged complicity. If so, this would hardly help normalise relations. South African officials insist, though, that there is no confusion in Pretoria's mind about relations with Rwanda. One told ISS Today this week that the delay in launching the Karegeya inquest had been the result purely of the disarray in the National Prosecuting Authority under Zuma. And the fact that it was taking place now had nothing to do with pressure from the likes of Batenga or greater determination by the Ramaphosa administration to see justice done for Karegeya. 'It's just that due process has been restored under the current administration,' the official said. Meanwhile, efforts to normalise relations would continue, the official said. He noted that Ramaphosa and Kagame had deputised their respective foreign ministers to implement their decision to do so. South Africa's international relations minister Lindiwe Sisulu will soon meet her counterpart Richard Sezibera to thrash out the terms of a rapprochement. Sezibera will no doubt urge South Africa to stop harbouring dissidents like Kayumba whom it accuses of plotting to overthrow Kagame's government. Though Pretoria would love to get rid of Kayumba, it has failed to persuade any other, neutral, government to take him. South Africa is unlikely to hand him over to Kigali, though the official noted, rather ominously, that Rwanda no longer had the death penalty and had recently released some political prisoners. The absence of the death penalty is hardly likely to offer much comfort to Kayumba since it apparently didn't stop his government from trying to bump him off extra-judicially three times. Pretoria might, however, agree to persuade Kayumba to stop his opposition politics as a condition for continued residence in South Africa. He belongs - as Karegeya did - to the Rwandan National Congress, which campaigns against Kagame from abroad. The official said South Africa felt that such politicking was inconsistent with Kayumba's asylum status. No doubt better relations with Rwanda would be good for South Africa, if only for Ramaphosa to counter Kagame's growing influence on the continent. This is something Zuma could not do because he was hamstrung by his own political and ethical baggage. Anton du Plessis, executive director of the Institute for Security Studies cautions that in making up with Kagame, a leader with a poor human rights record, Ramaphosa should not abandon the mantra that has been central to the identity of his administration - a 'new dawn' where rule of law matters.